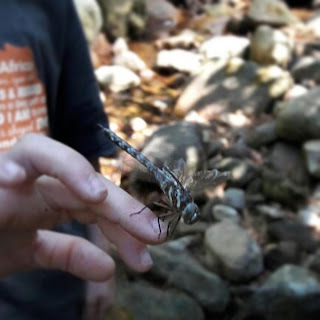 The following is a guest post by Bianca Browne, a certified children's mindfulness and meditation facilitator who offers classes and workshops in Cape Town, South Africa. 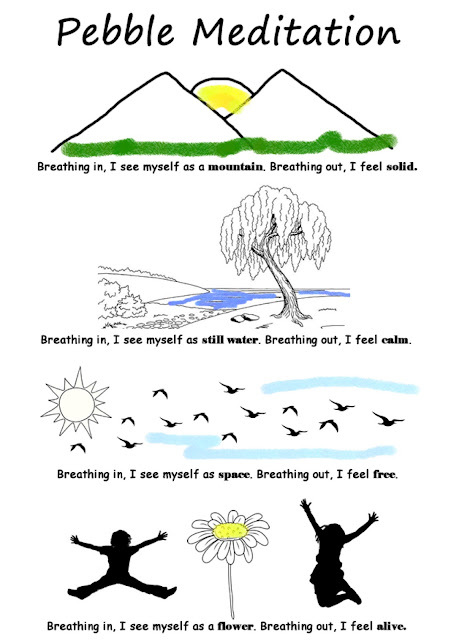 Mindfulness and nature. For me, the two go hand in hand. There is something about being in nature that encourages me to pause and be still. Maybe it is the abundance of fresh air. Maybe it is that wonderful, earthy smell. Maybe it is the soothing sounds of nature. Maybe it is an awakening of all my senses that helps me to be present in the moment. All I know is that nature is my go-to place to find the calm within. It is for this reason that I run my “My Parent and Me!” mindfulness workshops in our nearby forest whenever possible. Recently we had a wonderful workshop in the forest with the focal point being the river. Despite the severe drought in Cape Town at the moment, the river was still flowing gently. What a privilege to be able to sit on its banks and listen to the soft, soothing sound of the flowing water. “I breathe slowly in, I breathe slowly out. My breath is a river of peace. I am here in the world. ~ from “Breathe and Be” by Kate Coombs. Many of the children and their parents at the workshop were new to mindfulness and had come to find out more. So I started by taking some time to discuss what mindfulness is. The children ranged from 4 – 10 years old so I kept it simple. I explained that mindfulness is about noticing. About slowing down and taking a moment to notice the things around us. For example, picking up a stone and studying its shape, colour and texture. Noticing any interesting grooves or patterns that it might have. Suddenly a simple stone becomes something much richer. We then spoke about how mindfulness is not only about noticing the things around us. It is also about noticing what is happening inside ourselves - connecting with our bodies to notice and feel what is happening inside. I asked everyone to close their eyes and listen to the sound of the nearby river flowing. I asked them to notice if anything happened to their breathing or heartbeat as they did this. Some noticed that their breathing slowed down and calmed. Others felt it stayed the same. I was pleased with this honesty since it gave me a chance to explain that there is no right or wrong in mindfulness. The goal is not to be calmer (although that wonderfully often happens). It is simply about awareness, with no expectation. Awareness with kindness and compassion. After connecting with the breath, we did a mindfulness tactile exercise. The children all got to blindfold their parents – much excitement! Each parent was then given a stone to feel for a moment. Afterwards, the children placed all the stones back in the centre of the circle. The parents then took off their blindfolds and tried to recognise their stone. Great fun! We then swopped and the children had a chance to try. 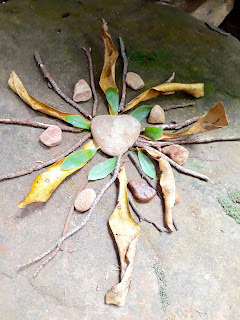 It was a lovely, concrete exercise in bringing awareness to the present moment through touch using objects from nature. 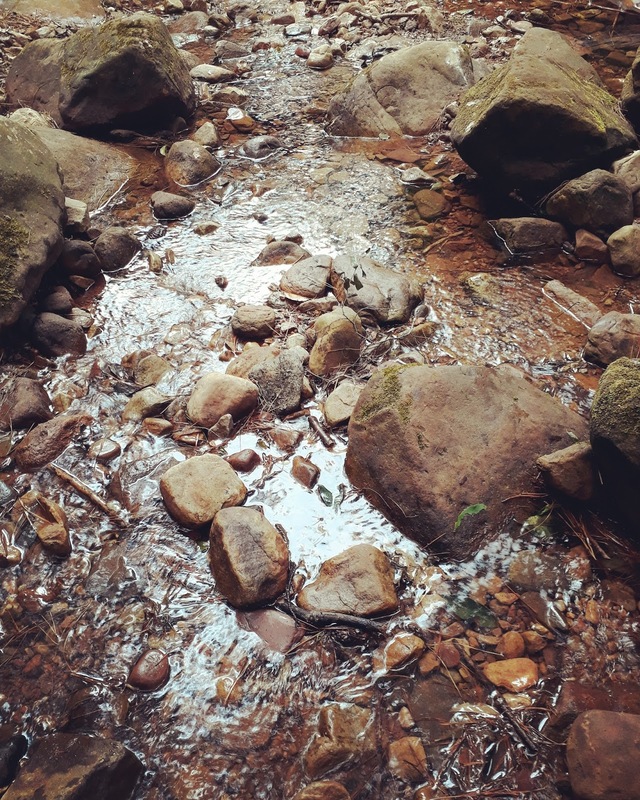 Keeping in theme with the focus on the river, we then explored the powerful pebble meditation which I had adapted from the book “Planting Seeds” by Thich Nhat Hanh. I asked the parents and children to take some time to explore the river together and find 4 pebbles, while keeping awareness of their breath. I encouraged them to sit together, listening to the sound of the water and noticing their breath. I again offered the mantra “Breathing in I am calm. Breathing out I smile” if it was needed. On coming back to the circle, everyone placed their four pebbles in front of them. I asked everyone to pick up one pebble. To hold it in the palm of their hand, gently supporting their palm by placing the other hand underneath. I then explained that the first pebble represented a mountain. It encourages us to feel strong and solid. We said a mantra for each pebble, allowing ourselves to be that object. So not simply to have a picture of a mountain in our minds, but to really imagine being the mountain. We did the same for the other three pebbles. Breathing in, I see myself as a mountain. Breathing out, I feel solid.Breathing in, I see myself as still water. Breathing out, I feel calm.Breathing in, I see myself as space. Breathing out, I feel free.Breathing in, I see myself as a flower. Breathing out, I feel alive. After we had said all 4 mantras, we returned the pebbles to the river, giving thanks. Everyone then found a comfortable spot to sit and we went on a “Sound Safari”. I gave each parent-child pair a worksheet of possible sounds they might hear that they could tick off. There was also space for them to add sounds of their own, as well as draw a sound map identifying where the sounds were coming from. A simple sound awareness exercise done during the day – taking just a few moments to connect with the sounds around us – can help us to slow down our heart rate and breathing, and connect with the calm within. We then moved into a time of expression through art-in-nature. 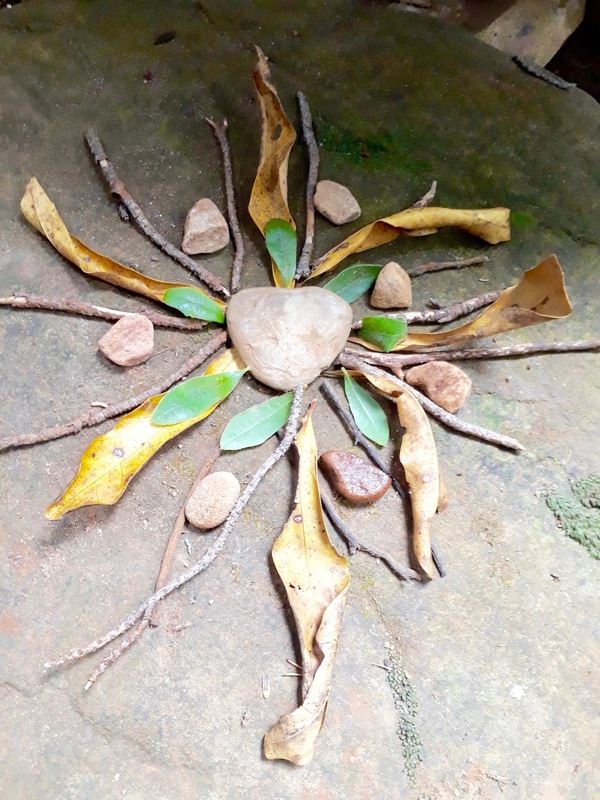 So, using anything that they could find in the forest such as sticks, pine cones and leaves, the children were asked to make a nature picture. I also asked them to pay attention to the different textures – smooth, rough, prickly, soft – as they put their picture together. It is a wonderful activity that encourages imaginative thinking but also helps draw attention to the present moment through touch. The children understand that the picture is not something that can be taken home which frees them up to really enjoy the experience of making the picture, with no concerns about having a perfect picture to take home. I also included a short, guided visualisation in the morning’s activities. I used the script from one of the tracks on my children’s mindfulness CD “Mindful Moment for Minis”. The track I used was “The Enchanted River” which tied in really nicely with the morning’s focus. It was then time to end our wonderful workshop in the forest. I hope that the activities mentioned above will offer inspiration and encouragement to others. If you found them above useful and would like more, please sign up on my website www.mindfulminis.co.za to receive the weekly Mindful Minis blog. 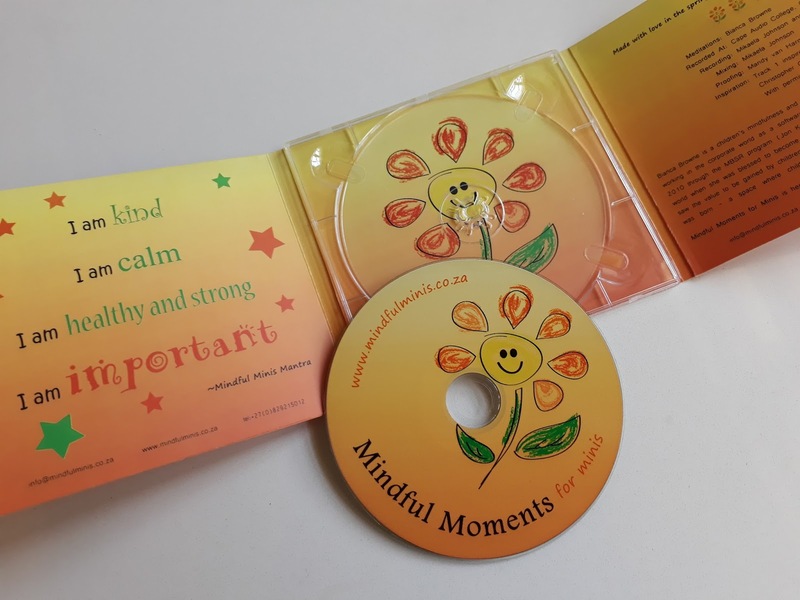 If you are looking for some children’s guided visualisations, the Mindful Moments for Minis album is available on iTunes. It is aimed at children ages 3 – 12 years old. The eight guided visualisations on the album aim to nurture and strengthen a child’s spirit while offering them an opportunity to be fully present and connect with the deep calm that exists within each of us. Most of the tracks on the album are set in nature.